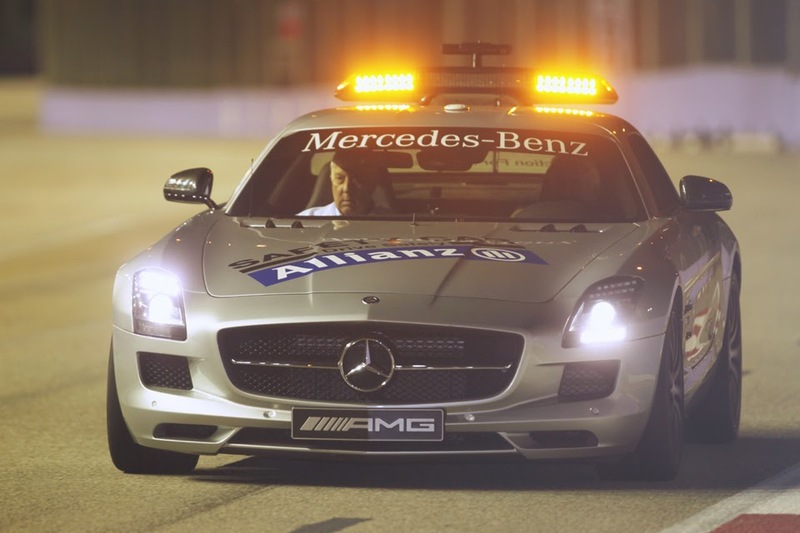 The Singapore Grand Prix and the safety car are pretty much inseparable. In every race ever at the Marina Bay track it has appeared at least once. On occasion its presence here has been, um, notorious. But while this year the safety car appearance wasn't quite so controversial as, you know, that, it still caused a bit of chatter. Simply in the length of time that it was out there. 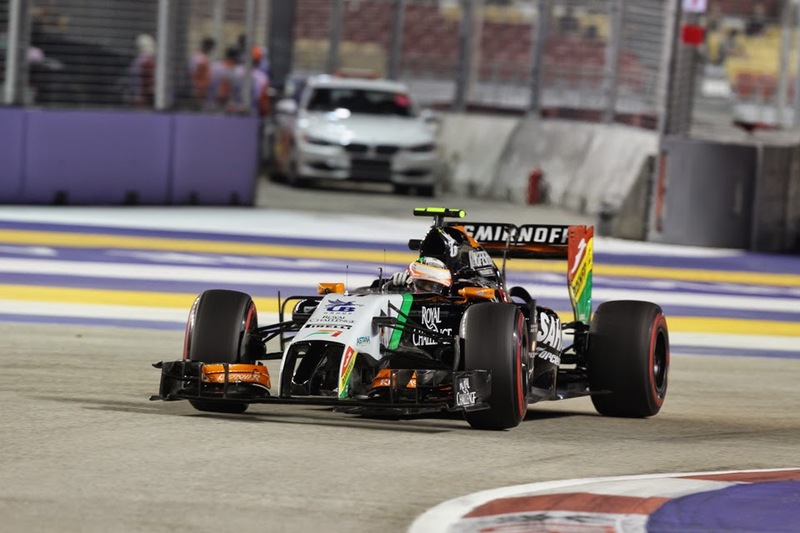 On lap 31 the safety car was deployed, after Sergio Perez's front wing detached following contact with Adrian Sutil which resulted in carbon fibre shards scattered all over the track. Come lap 35 the debris was cleared - which in itself seemed a bit tardy, given the marshals were oddly bereft of brooms, but that's another story. But almost that same amount of time again was then added onto the safety car lull, as on the same tour in accordance with the way of things the lapped cars were allowed to go ahead of the queue in order to get their lap back. Not until lap 38 - by which time most of the lapped cars had caught up the back of the pack - did we have green flag racing again. The rule of allowing lapped cars to unlap themselves under a safety car has come and gone over recent times, which rather underlines the extent that the value of the practice is marginal. In mid-1992 the safety car was introduced (or reintroduced if we are to be pedantic). In 2007 the rule of letting lapped cars unlap themselves was brought in. In 2010 it was ditched, mainly on the grounds of the time in which we could be racing that was wasted by it. For 2012 for some reason it was brought back. And it remains. But sure enough reintroducing the rule brought back exactly the same problems. OK in this case in Singapore last weekend it was an extreme given the long, close to two-minute, nature of the lap. Nevertheless one is put in mind of Einstein's theory of insanity - of doing the same thing over and over and expecting different results. Add to this that apparently next year after safety cars we are to get standing restarts (though Bernie's since hinted that the idea is to be scrapped) which if so will only add to the delay. Since mid-1992 the safety car has become part of the F1 fabric. And this letting lapped cars by is justified as a means of ensuring that the dicing between the leaders after they are released subsequently is not disrupted. But as some kind of extension of the safety car becoming habitual it seems a few of us have forgotten the extreme unfair and arbitrary nature of them. Indeed they seem to have gone way beyond even that and developed an odd sense of entitlement about them. Whatever is the case trying to argue that they do bad by the cars that are behind strikes as highly inappropriate. I recall too the debates when the safety car was being brought in as mentioned in mid-1992. Despite the name safety was not the issue. Instead in a season of Williams FW14B demonstration runs the prospect of artificially closing up races enticed. As did that of not having to throw the red flag nearly as often given all of the implications that those delays had for the king of TV's scheduling. There was very little high principle in it in other words. Those behind the leader in safety car deployments are net winners no matter what, and win entirely because of fortune. For them to then complain - or have it complained on their behalf - that on top of this that, poor diddums, they've got a car a lap down in the way when the safety car is released, is what? Just old-fashioned cheek? Frankly they should be thanking their lucky stars for what they got out of it. And if they do end up with backmarkers in front of them that's just too bad. The way the cookie crumbles. There's also the fact that thanks to strict blue flag application lapped cars leap out of the way immediately these days in a way they didn't used to. Furthermore time was that watching leaders dive past backmarkers with the minimum of delay was a key part of the thrill for us watching on, and a key part of the game. Ayrton Senna in particular was a master at it. But that's yet another story.